. :: LAUNCH OF HORSE TIMES LONDON 2012 OLYMPIC EDITION ::. 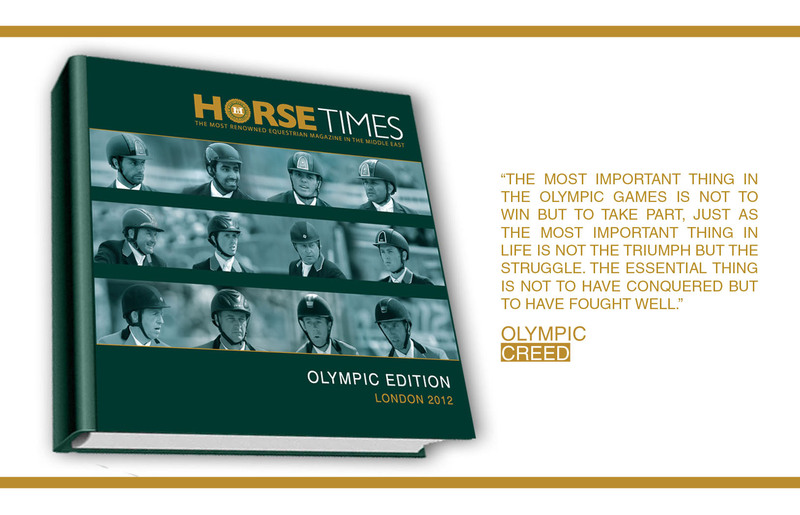 We are proud to announce the launch of the London 2012 Olympic Edition of HORSE TIMES Magazine. The Edition comes as a hard-cover book, featuring photographs taken by international photographer Cymon Taylor - of every medallist from the three Team and Individual disciplines of the equestrian events. It also features photographs of Para-Equestrian winners, Olympic moments, other Arab equestrian participants, and the Royal Cavalry of Oman performing for the Diamond Jubilee of HM Queen Elizabeth II in the run-up to the Olympics. The Edition is about capturing those expressions of joy, elation, pain, and struggle, and the gruelling time, effort and hardships undertaken in preparation for the Games, all of which can be seen on the faces of both horses and riders, confirming this special bond of partnership. It also highlights the thrill and enthusiasm of the spectators from all over the world, cheering and encouraging their favourite horses, riders, teams and nations, on the magnificent grounds of Greenwich Park. Again, this Edition aims to recognise those historic moments as well as to document them for they will remain a lasting and true demonstration of the power of the will. The idea of putting together the Edition seemed very challenging and we did not realise the enormous effort involved, and we promise you, each and every choice of photographs and text featured as well as the print and delivery procedures required great attentiveness to details that at a time were overwhelming. Yet when we held the Edition in our hands....it all gave us plenty of joy as well as a lasting sense of pride, apart from its historical value. Copies have been distributed internationally and we will soon announce a small celebration to take place locally, as well as post a copy on the website for our online viewers, fans and followers.